You may have noticed our absence on these hallowed grounds where we pitched our spiky tents last year, and you’d be forgiven for thinking we’ve lost a little steam. 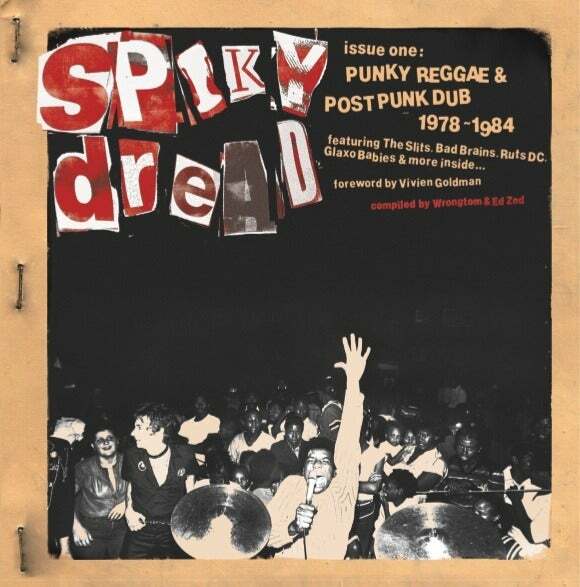 In fact it’s quite the opposite as we’ve been heads down and hunting for the owners of some of our favourite spiky dread moments, what with the threat of our compilation creeping ever closer. 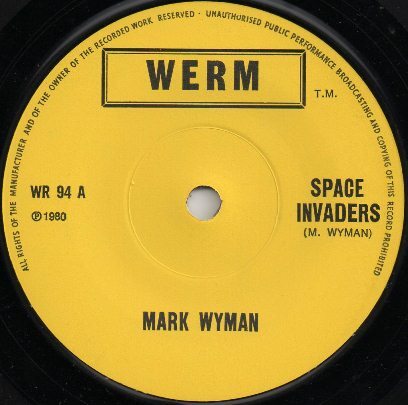 However, one artist who’s been alluding me for quite some time is the mysterious Mark (Crucial) Wyman, who back in 1980 put pen to paper, and then amp to Ampex to deliver one of the finest slices of punked-out disco-dub that’s ever been committed to tape, in Kentish Town at least. 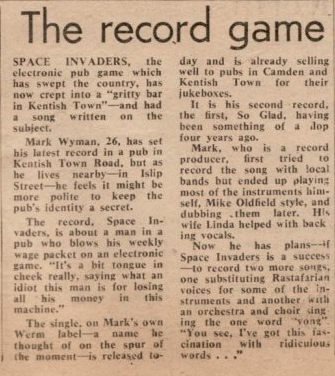 Aside a few copies of the self produced 7″ changing hands, and a modicum of immaterial info, I’ve come up with no leads, aside Space Invaders’ bassist Dave Burke who’s Reverb Nation page features this newspaper clipping. A footnote to this post; another guy that crops up on the release is drummer Joe Coulson, another name which garners little whilst googling but it’s very possible that he’s the same Joe Coulson who I’m led to believe played drums on this funk oddity from Carol Lee Scott, otherwise known as Rod Hull’s arch nemesis Grotbags. This entry was posted in Uncategorized and tagged Carol Lee Scott, Dave Burke, Grotbags, Joe Coulson, Kentish Town, Mark (Crucial) Wyman, Space Infaders, Space Invaders, Werm. Bookmark the permalink. I’m not Mark Wyman but I used to know him. I met him when my band State of Grace recorded our first demo at Wave Studios in Twickenham in 1980. Mark was working as an engineer there, including on our sessions. As well as producing his own material, he was also doing quite a bit of engineering work. I remember him mentioning that he did the engineering on the Tourists’ album. I got quite friendly with him and he gave me a copy of the ‘Space Invaders’ single, which I still have. He liked my drumming, and a while later he got me to play drums on two tracks of his. He was planning to release more singles but I’m not sure if he ever did. I remember playing drums for him at Gooseberry 2 (aka Hillside), which was in the Streatham/Tulse Hill area. I think the last time I saw him was in 1982, by which time he’d opened up a TV repair shop in north London. I recall he mentioned that he and his wife were shortly due to move to the U.S. (Texas, I think). Linda, very sorry to hear that Mark passed away.